In Montana and throughout the west, agriculture is a primary industry and water a valued resource. Water, either as rainfall or snow melt, is conserved during the spring and later portioned out in the drier summer months to water cattle and to irrigate crops. Therefore most ranching operations have at least one, if not several reservoirs or man made lakes on their property. Throughout the Rocky Mountain states there are literally thousands of these lakes which have been created. While ranchers are primarily concerned with producing cattle and growing crops, historically these reservoirs and lakes were often stocked with trout for family and friends to enjoy catching a few fish for the frying pan. Many of these lakes have tremendous aquatic invertebrate populations which include, damselflies, mayflies, caddis, midges, scuds and leeches. At times one could find unusually good fishing in these lakes, but it was often short lived due to high rates of sedimentation, greatly fluctuating water levels and temperatures. Since the release of the movie, "A River Runs Through It", and as more fly fishermen come to Montana hoping to find big fish pulling back, more and more ranchers, outfitters and entrepreneurs have begun to recognize the recreational value of their water resources and are beginning to properly manage their lakes as trout fisheries. 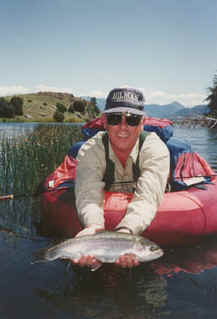 Consequently, one can often find many quality trout fisheries developing throughout central and western Montana. While these lakes are most often stocked with rainbows, one can also find reservoirs which have been stocked with brook, brown or cutthroat trout as well. Typically these lakes are stocked with smaller fish, (8" to 10"), but due to the high productivity of the lake systems, the fish grow quickly and finding lakes where the fish average 17" to 20" (2 to 2 ½ lb.) is not unusual. Many of these lakes will also grow fish to 4 and 5 lbs. and at times even larger. 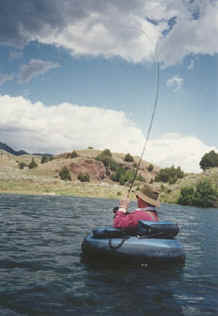 One of the most effective ways to fish these lakes is to use a float tube. Float tubes are basically truck inner tubes placed into a nylon cover. This nylon cover has a seat in which the angler sits upright wearing chest high, stockingfoot waders with his feet dangling in the water below. One places scuba fins on the feet, which when gentling "kicking" helps propel the tube from one place to another. It requires very little effort to move the float tube. The fisherman sits in a comfortable position, moving to the rear. Most tubes are equipped with a backrest for back support (contains extra inner tube for safety), stripping apron to help keep the fly line out of the water, gear pockets and a crotch strap to help keep you from sliding off your seat and into the water. Once one masters the art of maneuvering the float tube, one can access water unavailable to the shore bound fisherman. Float tubing is an intimate fishing experience and the quieter one moves, the closer one can get to stillwater fish. In addition, deer, beaver, muskrat and herons also appear to be less threatened and will permit the fisherman to observe, undisturbed by his presence. Longer graphite fly rods, 8 ½ to 9 ft., designed to cast 5 or 6 wgt. 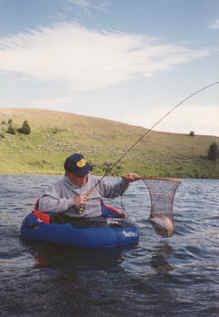 lines are best for float tube fishing Montana lakes for trout. Most of the time a double taper floating line or a slow sinking intermediate line is adequate, especially when the fish are feeding or lying in shallow water. However when the fish are in deeper water, a Type II full sinking line is often required to get your fly down to the proper level. Type III and Type IV full sinking lines would be used when fishing very deep water. When fishing sinking lines with nymphs or streamers, leaders between 4 and 6 feet are usually appropriate and when fishing floating lines with small dry flies and nymphs to selective fish, leaders will range from 10 to 12 feet. One useful strategy when fishing Montana lakes for trout during the early summer would involve fishing fly patterns which imitate nymphs. For example, Callibaetis and damselflies are commonly found in many Montana lakes. Therefore, if one understands that trout will be where the nymphs are most concentrated and active and that these nymphs prefer the safety of aquatic vegetation, then an effective technique would be to fish Callibaetis and damselflies nymph patterns over and alongside weed beds and shorelines prior to and during a hatch. Simply cast the fly to the weed beds, let the fly sink to the appropriate level and slowly strip the line to retrieve the fly. Useful patterns include Callibaetis flashback, #16-#20, Hares Ear, #16-#20, Olive and Brown damsels, #8-#10. 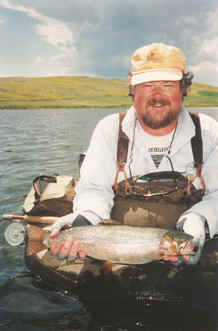 A second useful strategy when fishing Montana lakes for trout during the early summer is to fish streamers. Streamers are used as searching flies and can be used to fish many locations including the shoreline, shallow water, deep water, edges of drop offs and structure such as logs and debris piles. As with the nymph, make the cast, let the fly sink to the appropriate level and strip the line to retrieve the fly. At times, one must experiment with the speed of the retrieve to find which the fish will prefer. Sometimes a slow, strip is required and at other times a moderate or fast strip works best. Streamers such as brown, olive and black Woolly Buggers, Flash-a-Buggers, and Marabou Leeches, #8-#12 can all be effective. Casting dry flies to rising fish and using them as searching flies are two other effective strategies to catch trout on Montana lakes. When fish are observed rising, the first objective is to determine what they are eating. It’s possible that they might be taking, mayfly, damselfly, caddis or midge adults. The second objective is to chose the appropriate pattern such as: Parachute Adams, #14-#18, (mayflies), Adult Blue Damsels, #10-#12, Elk Hair Caddis, #14-#18, and Griffith’s Gnats, #16-#22, (midges). Remember that trout in lakes will cruise to search for food. One must observe in which direction the fish is swimming and cast the fly to the spot where one thinks the fish is likely to surface next. Make the cast, let the fly sit on the water and let the fish find the fly. On windy days grasshoppers, ants and beetles are often blown into the water and fishing patterns to imitate these insects, late in the summer, can offer some exciting fishing. If you are interested in float tubing a Montana lake contact Greg Mentzer, outfitter/owner of Montana River Guides. He has been guiding in Montana since 1985. All photos by Greg Mentzer. Copyright © Gregory G. Mentzer, June 1998. All rights reserved.